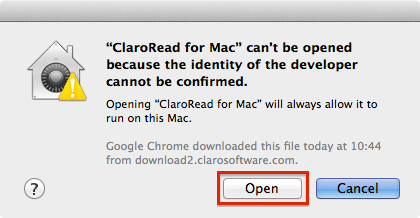 When you try to install ClaroRead for Mac (or any other Claro Mac apps) on your Mac, you may see the error message “ClaroRead for Mac” can’t be opened because the identity of the developer cannot be confirmed when you try to run it. 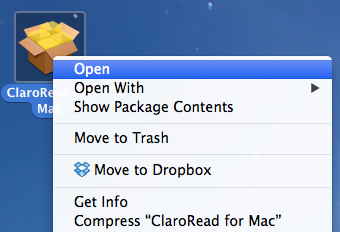 Hold down the Ctrl key while clicking on the ClaroRead installer. For more information about this error from Apple, please see macOS Sierra: Open an app from an unidentified developer.